How long have you been at working Grand Mercure Puka Park? Puka Park has been my second home for the last 8 ½ years. Having been to the resort for the first time in 1996 and having worked here in consequent years as massage therapist I started off in November 2008 as a part timer doing reservations, which was giving me just enough of a break from my than 2 year old. However it didn’t take long until I got racked into working full time and I haven’t looked back since. What a more beautiful office could you have? 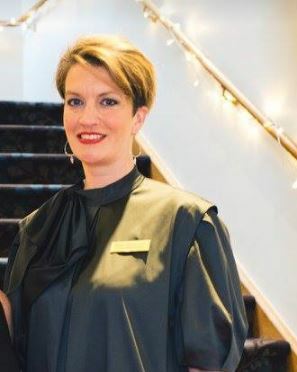 With a previous background in hospitality I have not only occupied many different roles in this hotel but done a vastly varied range of jobs. One of the stand out moments must be chopping down a fallen tree with a hand saw in skirt and high heels. After several years as Senior Assistant Manager I was given the opportunity to shift into Sales which gets me out and about seeing conference clients in the cities and proudly telling them about our gem hidden in the Coromandel bush. We truly love welcoming guests who share our passion for this special place. Grand Mercure Puka Park is not the only thing I am passionate about but also the entire Coromandel Peninsula. One of my best memories is a trip to Germany in conjunction with the NZ Tourism Board and Air New Zealand in 1999. We were accompanied by the cultural group of the late Dame Te Ata who performed in front of 1000’s of people during the Road Show that featured the best of NZ in a slide show. I was fortunate enough not only to represent Puka Park but also the local tourism board, now Destination Coromandel. What has always fascinated me the most about the Coromandel is its diversity with its stunningly rugged road meandering along the water edge from Thames up to Coromandel, the wilderness of the bush clad ranges in the middle and the truly world class, kilometre long sandy beaches along the East coast. As if that wasn’t beautiful enough, the real Coromandel magic starts for me only north of Coromandel Town, which I love for its historic and arty ambiance. To drive past Coromandel Town you should really plan in a night’s accommodation as with the windy roads it becomes a long trip otherwise. Not only will you drive past gorgeous little bays with islands splattered out to the Hauraki Gulf but once you pass Colville with its yesterday charm you will feel like travelling back in time. Driving up the West coast towards Port Jackson at the tip of the Peninsula, you may imagine a horse drawn cart coming around the corner from behind one of the ancient Pohutukawas at any time. What is your favourite time of year in Pauanui? Autumn seems the be best time to discover the area as it is not as busy as in Summer and the weather tends to be beautiful, sunny and stable, just ideal for relaxed walks on the beach or a bike ride along the walkway up the Tairua River. Best thing to do on a rainy day around the area? On rainy days it is as though the Coromandel hides underneath a blanket of clouds. Puka Park then almost shines even more than on sunny days, nothing is more cozy than huddling in front of the fire place with a hot chocolate, a good book and a warm blanket on your knees. Whatever you fell like doing on your next stay, please don’t be shy to ask our wonderful reception staff for ideas, who love sharing their secret favourite spots of the Coromandel.